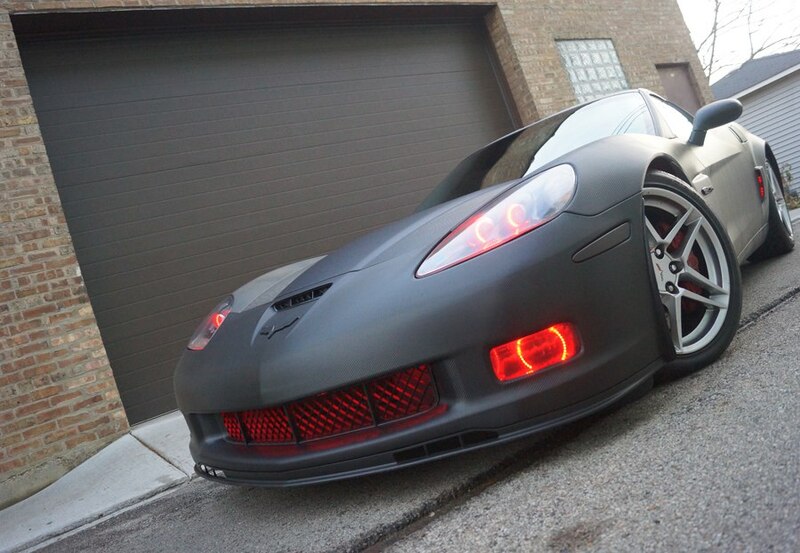 The Carbon Fiber Matte Black Car Wrap was applied to this 2007 Chevy Corvette ZO6. The Carbon Fiber Matte Black Car Wrap was done with precision care. Carbon Fiber was applied to the full car except the center of the hood and lower grille which was done with Matte Black. The Carbon Fiber Matte Black Car Wrap can hold up to the weather conditions, and is very easy to clean and maintain. What is a Carbon Fiber Matte Black Car Wrap? A Carbon Fiber Matte Black Car Wrap is a vinyl material that gets applied directly over the original paint of your vehicle. The application of a Car Wrap allows you to change the vehicles appearance in a short period of time, and also allows you to remove the Car Wrap, returning the vehicle back to its original condition. This vehicle also had a set of red halos added to it for that pop! Along with the halos and wrap, Kooks Long Tube Headers were added accompanied by a Corsa Exhaust. If you have any questions about our Car Wraps, please call 773-583-3770 and speak to one of our specialists. If you would like to view the full gallery of this vehicle, please click here! This entry was posted in Blog and tagged Car Wraps, Carbon Fiber Vehicle Wrap, Carbon Fiber Vinyl Wrap, Carbon Fiber Wrap, Corvette Carbon Fiber Wrap, Corvette ZO6 Matte Black Wrap, Corvette ZO6 Wrap, Matte Black Vinyl Wrap, Matte Black Vvehicle Wrap, Matte Black Wrap, Paint Protection, Vehicle Wrap.